On September 21, 2018, two tornadoes ripped through the Ottawa-Gatineau region, causing mass damage to the Dunrobin and Greenbank neighbourhoods in Ottawa, as well as the Mont-Bleu area in Gatineau. At the Ottawa Renewable Energy Co-op, we wish well to all those affected, and hope that a state of relative normalcy returns as soon as possible. It is in times like this that we are reminded of the importance of community, and the need for mutual support of one’s neighbours. Two of the Co-operative’s projects suffered hail damage during the storms. The Dunrobin project had one panel damaged, while the Smith Farm project had eight panels damaged. Despite this, both projects continued producing energy. The panels are insured, and the Co-op staff are actively working towards replacing these panels before any loss of production occurs. We at the Co-op are very grateful that none of our projects or the buildings on which they are located were damaged in any significant way. Ten of the Co-operative’s 17 projects were shut down along with the grid on Friday. Most projects were back up and running within 24 hours, and two projects were able to resume production within 48 hours. As Monday morning, all 17 projects are online and producing energy. Again, the Ottawa Renewable Energy Co-operative is incredibly grateful to both Hydro Ottawa and Hydro One for their hard work in restoring the grids and allowing generation to resume. In financial terms, this storm caused approximately $3,948 in lost revenue, amounting to less than 0.5% of the Co-operative’s annual revenues. The Co-op also incurred about $2000 in equipment damage. Over the weekend, the Co-operative was tabling at Green Energy Doors Open Ottawa at Lansdowne’s Horticulture Building. There was much discussion of how climate change is causing more extreme weather events like the one that had just affected the region. While this is an important discussion to have before the news cycle moves on from this disaster, there is a much more local issue that this highlights. The length of the power outages that some parts of the City of Ottawa experienced (and are still experiencing, in some cases), demonstrates the fragility of our centralized electrical grid. The figure above was widely circulated in the wake of the tornadoes in the Ottawa-Gatineau region. 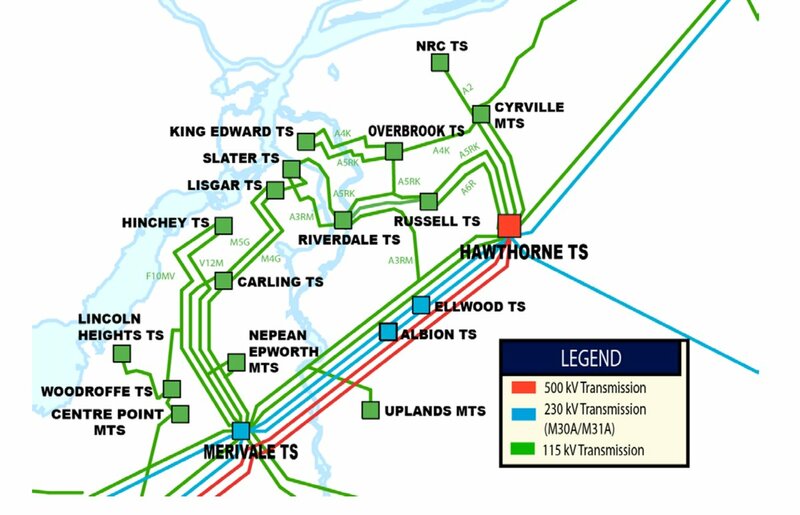 It provides a view of Ottawa’s transmission stations, with the different size of these stations highlighted by colour. What becomes glaringly apparent to many is just how reliant this city is upon the two main transmission stations of Hawthorne TS and Merivale TS. 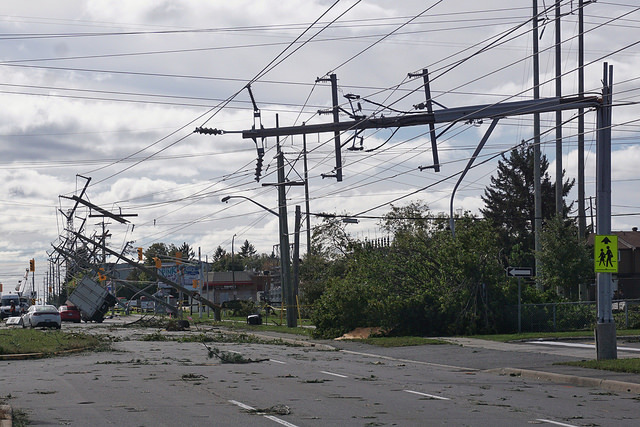 During the storm, Merivale TS was significantly damaged, resulting in a loss of power for most of the city’s west end. The solution to this grid fragility is a shift towards distributed generation; a grid where energy is generated close (or closer, at least) to where it will be consumed. A 2015 baseline study of the City of Ottawa’s energy consumption and generation patterns revealed that only 5% of energy consumed in Ottawa was generated within the city’s geographic boundaries. Another study, carried out by the non-profit Quest, shows that most of the money put towards energy in many municipalities, in particular those with large populations like Ottawa’s, leaves those municipalities. The increased development of distributed, renewable energy generation must become a major goal for the City of Ottawa, as well as the province of Ontario and Canada more broadly. A shift towards a distributed generation electricity system provides incredible resiliency for the grid, increases security for the city, reduces the flow of energy dollars outside of the municipality, and lowers greenhouse gas emissions. What’s more, during the period following the storm, Hydro Ottawa and Hydro One reiterated the need for conservative energy use one power had been restored across the city, so as not to put undue stress on the still-vulnerable grid. The Co-operative’s projects are important at this stage, as their localized generation serve to lower to energy demand seen by substations, meaning less energy from the primary transmission stations is required in those regions. Groups like the Ottawa Renewable Energy Co-operative are actively working towards this goal, and doing so through a co-operative, community-driven approach. The members of the Co-op are enabling this transition, as the organization shifts its focus towards net metering projects, allowing for on site consumption. With the introduction of batteries to these projects, municipal buildings, institutions, and businesses will be able to keep the lights on when storms like these strike again. Looking for ways to support those affected by the tornadoes? Click here for a variety of ways to help.